Kenyan Chief Justice David Maraga and colleagues nullified Uhuru Kenyatta’s election victory. Net photo. KENYA–Jubilee’s radical election law amendments introduced in Parliament yesterday would make it almost impossible to invalidate a presidential election. The amendments that come only 27 days to presidential rerun will also slash the powers of the Judiciary and the IEBC chairman. The Supreme Court, which nullified President Uhuru Kenyatta’s win, says it will not hesitate to do the same on October 26 if the poll again violates the Constitution and other laws. So Jubilee is moving fast to tie the Judiciary’s hands and limit its independence before the poll. A date for the vote has not been set but the amendments will sail through because of Jubilee’s tyranny of numbers. But NASA James Orengo yesterday said the opposition will take the battle to the people, adding Jubilee “will be responsible for whatever will happen thereafter”. Jubilee rejected NASA’s claims, saying the proposed legislation is only meant to close loopholes and remove ambiguities raised by the apex court when it overturned Kenyatta’s election. Jubilee also wants numbers to be key in determining a presidential petition at the Supreme Court, meaning a petitioner will have to prove to the court that violations of the Constitution or any electoral law significantly alter the presidential outcome as declared. (Left – Right) Hon Lady Justice Njoki S. Ndungu, Hon. 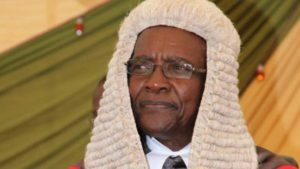 Justice (Prof.) Jackton Boma Ojwang, Hon. Lady Justice Philomena Mbete Mwilu (Deputy Chief Justice), Hon. Justice David K. Maraga (Chief Justice), Hon. Justice Mohammed K. Ibrahim, Hon. Justice Dr Smokin C. Wanjala and Hon Justice Isaac Lenaola. Courtesy photo. On one side, Vice Chairman Consolata Maina and commissioners Abdi Guliye, Paul Kurgat and Boya Molu have fiercely opposed changes sought by Chebukati notably his planned purge after the Supreme Court ruling. Chebukati’s explosive memos to CEO Ezra Chiloba in which he admitted the nullified poll was deeply flawed has embarrassed Jubilee, which has argued any errors were minor and inadvertent. Opposition and NASA flagbearer Raila Odinga yesterday described the laws as despotic and meant to create rigging loopholes. He called for massive countrywide demonstrations every Monday and Friday. 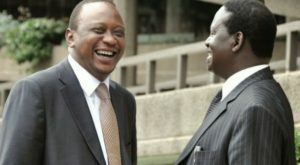 President Kenyatta and Raila during happier times. Net picture. “The problems which we were faulted on by the Supreme Court were not for lack of law. As we speak, we do not need any law for purposes the October 26 election,” Chebukati said.